The Newmarket Farm Dig project may have slowed right down, but I certainly haven’t given up! Given that it is one of the most ambitious projects I have ever attempted – my first ever dig and I am in charge – I think I have done pretty well so far. I fairly recently had a really useful chat with Hilary Orange (Senior Archaeologist at University College London’s Centre for Applied Archaeology). From her, and others I have spoken to over the past few weeks, I have learnt that I could do so much better if I gain more practical experience before I start digging again, including the post-excavation stage of last year’s dig where I am right now. With this in mind I signed up to a one week archaeological training course last June with the Sussex School of Archaeology’s Roman dig at Plumpton. It was really good to be able to learn directly from ‘real archaeologists’. Again I learnt, whilst I didn’t always manage to follow best practice last year, I did not do such a bad job. I have also started volunteering with Sussex Archaeological Society’s Bishopstone Tidemills dig, where I am also gaining yet more skills and practical advice. It is important that I build a network of useful contacts. I have already made some good contacts with bone and military finds experts, which I will be making good use of when I start processing our finds during the next couple of months. Any pot and glass (1830-1942) experts out there – I would love to hear from you. I have also made contact with an English Heritage expert in farm buildings – Jeremy Lake. He has recently completed a mapping of all the historic farmsteads and outfarms in Sussex. His earlier work includes an excellent report on the historic farmsteads of South East England. It is hoped that we can meet sometime – if his busy schedule allows. 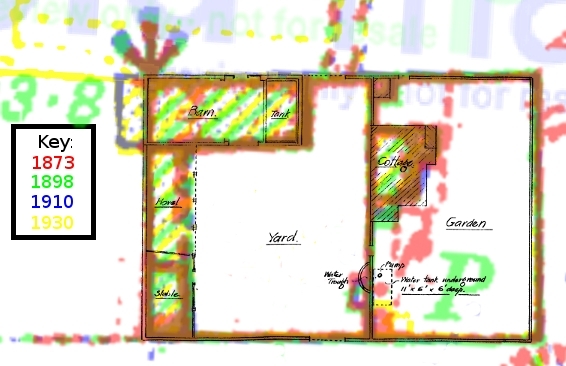 Plan showing the area of the barn in green superimposed over the excavated area of the cottage. Base plan from ESRO. It took 2 days a week over 10 months to complete an open area excavation of the cottage and its immediate surroundings. This was more than I could easily manage. Therefore, next time I would prefer to dig just one day a week, and over a more sensible period of April to October (6 months). This would mean that the trenches would need to be very carefully placed to maximize the information they might provide. However, I still haven’t fully explored the domestic area of the site. The yard area in front of the house revealed the original 1830 ground surface under a relatively deep made-up layer of domestic rubbish. It would be nice to look at that surface – with its flint paved path between the front door and the front garden gate – underlying the probable early 1930’s remodelling/rebuilding of this area, including the outside toilet. Coloured composite of OS maps (old-maps.co.uk) and a farm plan (ESRO), dated 1873-1930. Plenty to keep me busy with for the next few years – don’t go away!